Since the privatization of the railway system in 1995, many lines have fallen out of use and passenger services have been all but abandoned, leaving hundreds of kilometers of disused track and isolating some rural communities from the nearest large city. Much of Mexico’s historic railway infrastructure now lies in ruins. The state of Jalisco has started to recondition 120 kilometers of former railway routes as Green Route (Via Verde) trails for non-motorized traffic (hikers, cyclists, horse riders). Many of the old stations along these routes will be restored to provide essential services and exhibition space. The former train station in Ameca (on the extreme northern edge of the town) has been renovated to serve as the start of one of these routes, with exhibits focusing on the history of the railroad, local fiestas and the region’s haciendas. The lovely building, dating back more than a century, witnessed its last train in 1995. Given that the railways played such a key role in the Revolution, enabling both sides to move troops quickly around the country, it is fitting that they are now the basis for this new revolution involving cultural tourism. (Western Mexico, A Traveler’s Treasury, p 61). Others lines, elsewhere in Mexico, have been explored by two intrepid Mexican artists as part of an unusual geo-art project. Artists Ivan Puig and Andres Padilla Domene built a vehicle capable of traveling on train tracks and explored some of the country’s abandoned railway lines. As they went, they photographed hundreds of ruins and recorded hours of interviews with people they met. They later did something similar in Ecuador, but that’s another story. 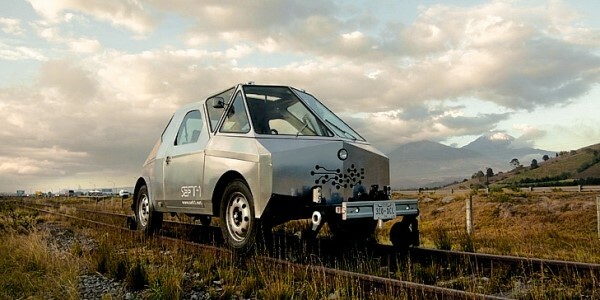 Their striking silver road-rail vehicle is known as SEFT-1, where SEFT stands for Sonda de Exploración Ferroviaria Tripulada (Manned Railway Exploration Probe). The artists recorded their experiences in videos, photographs and collected objects. Interviewing people they met, often from communities isolated by Mexico’s passenger railway closures, they shared their findings online, where audiences could track the probe’s trajectory, view maps and images and listen to interviews. Their first London (UK) exhibition, SEFT-1 Abandoned Railways Exploration Probe – Modern Ruins 1:220, was commissioned by The Arts Catalyst and presented at the Furtherfield gallery space in the heart of Finsbury Park. In the exhibit, the artists explore how the ideology of progress is imprinted onto historic landscapes and they also reflect on the two poles of the social experience of technology: use and obsolescence. For this exhibition, the artists also invited British expert model railway constructors to create scale reproductions of specific Mexican railway ruins exactly as they had found them. One gallery became a space for the process of model ruin construction. The room’s walls displayed the pictures, documents, plans and other materials used as reference for the meticulously-elaborated models. Ivan Puig (born 1977, Guadalajara) has exhibited internationally in Mexico, Germany, Canada, Brazil and the USA. Puig, a member of the collective TRiodO (with Marcela Armas and Gilberto Esparza), lives and works in Mexico City. Andrés Padilla Domene (born 1986, Guadalajara) has exhibited work in Mexico, the USA and Ecuador. His video work as director and producer with Camper Media includes documentaries, fiction films and TV shows. They are two interesting people. I suppose the next step is to stop supplying electricity and water to places with low populations where there is not enough money to be made.